Britain’s National Health Service is famous for being two things: One of the highest rated healthcare services in the world, and for being chronically underfunded. It isn’t about politics, Prime Ministers or technology — it’s about how costly it is these days to operate a modern healthcare system. Every Western country is grappling with the same issues, the UK isn’t extraordinary at all in this regard. For all the griping that goes on about the NHS it continues to excel, turning in first-place performances in prestigious healthcare surveys. Quite obviously the problem is funding a National Health Service that is tasked with caring for a growing and aging population. 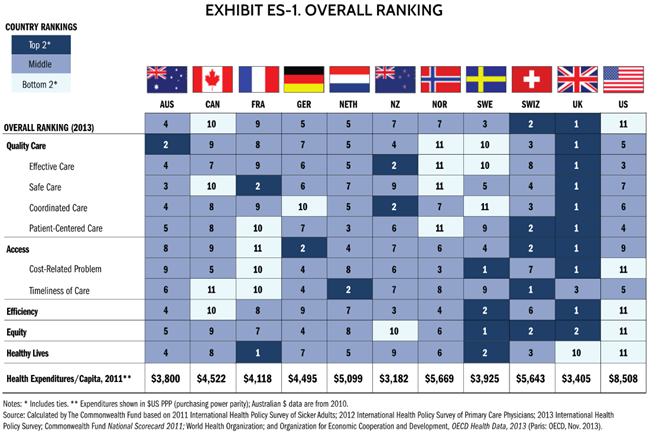 How does the NHS stack up against other Western nation healthcare systems? How does Britain compare against other Western healthcare systems? Image courtesy of the 2013 Commonwealth Fund International Health Policy Survey. Of all the ways to lower NHS healthcare spending — improving the environment that Britons live in is easily the most cost-effective. A highly regarded Harvard Medicine study informs us that coal-burning is responsible for up to $500 billion per year in additional healthcare, infrastructure and agricultural spending in the U.S. — so yes, up to half a trillion ‘externality’ dollars (annually) in America from burning coal alone. In the United States, coal accounts for 33% of America’s total electricity generation although coal-burning used to provide 70% of America’s primary energy demand. In the UK, coal-fired power generation is also falling. In 2016 we saw wind power generation surpass coal-fired power generation for the first time. Coal provided 9.2% of the UK’s total electrical demand in 2016, but for decades it provided more than 50% of UK electrical demand. As coal-burning in the UK continues to be replaced by clean energy (wind power = 11.5% of total UK demand in 2016) respiratory and related ailment rates continue to fall. It would be nice to think that leaving coal behind would lower NHS spending to an affordable amount. But that would be overly optimistic. Howevermuch Britain leads America in the race to leave coal behind, toxic air pollution from the thousands of diesel-powered lorries that pass through UK cities daily more than make up for it. In fact, air quality in London, Birmingham and Manchester is so bad that alarms are beginning to sound in many quarters. Some might underestimate the healthcare impacts of petrol and diesel-fueled vehicle pollution within cities. However, in 1974 it was common knowledge that an average of 80 people per day died in the city of Los Angeles alone as a result of air pollution from cars and transport vehicles during so-called ‘smog days’. People were dying on the sidewalk as they waited for the Ambulance to arrive. Fortunately, California implemented the first of many clean air laws and soon set the global standard for cars and truck emissions. And it has been a stunning success! With a population more than double since 1974, daily premature deaths due to air pollution in Los Angeles are practically unknown in 2017. And the L.A. economy continues to grow — no longer held back by an ailing population (who didn’t realize they were ‘that’ ailing until the new clean air standards kicked in) and everyone began to feel much better, and consequently found themselves outdoors and enjoying the fresh air more often. Due to topography and weather patterns in London, smog is a serious problem and has a measurable effect on the NHS budget. Manchester isn’t any better, nor is Bristol. Therefore, the UK must pass clean air legislation that exceeds even L.A.’s stringent air quality regulations. And the easiest way to do that is to lower coal-fired burning to a maximum of 5% of total UK electrical demand and ban diesel lorries from any city with more than one million residents. With the existing technology in hand these aren’t difficult targets. Many trucks (lorries) in the United States are now converting to compressed natural gas (CNG) in an effort to meet modern air quality standards. The trucks continue to run on diesel fuel, but CNG is injected into the engine any time the vehicle in under load (climbing a hill, getting up to speed, etc) and during times of city travel the vehicle can run on CNG exclusively which emits zero pollutants and zero particulate matter. CNG-burning produces carbon dioxide and water vapour only (neither is toxic) with a small penalty in overall power output. And such engines last longer than diesel-only engines. In Canada, former Prime Minister Pierre Eliot Trudeau passed legislation on a novel programme called ParticipACTION. It was a programme designed to get people walking, moving, exercising and it created awareness among citizens — that activity, especially outdoor activity, was a prerequisite for good health and long life. It was a popular government programme complete with kooky TV adverts that compelled an entire generation to get up off the couch and exercise. Government officials from all provinces handed out placards and Participaction lapel buttons, and flags with the Participaction logo emblazoned on them. If you couldn’t make it from your comfortable television viewing position out to the street in one minute — no cheap Participaction prize for you! And your neighbours thenceforth suspected you were somewhat less than a loyal Canadian on account of it. Participaction ended after years of success with many studies attributing Canadians good health to the Participaction programme. It produced measurable results and the politicians loved meeting citizens and giving them tacky Participaction merchandise in completely random and impromptu settings. Long after the programme ended, then-Prime Minister Stephen Harper restarted the Participaction programme and it continues to save all levels of government in Canada billions of healthcare dollars annually. All it took was simple legislation, some committed politicians from all levels of government, catchy TV adverts and tacky Participaction merchandise, to save billions of dollars in healthcare spending per year! Who’da thunk it? Many businesses are excellent corporate citizens, they just need to be asked. In many cases, corporations will fund a new construction (say, a new wing of a Hospital) in exchange for their corporate logo appearing prominently on the building, in the building lobby, or etched in concrete among the property landscaping. Sometimes it’s a tax write-off for a corporation involved in the construction of the project, sometimes it’s a corporation donating funding in lieu of paying tax on their profits. Either way, large corporations can become part of the solution. It doesn’t hurt to ask corporations how to make that happen more often (Perhaps a minor tax change?) You never know until you ask. In a time of obscene excess liquidity (multi-billions sitting in banks, doing nothing productive for the economy) a minor tax adjustment could trigger billions of pounds sterling to hit the NHS budget allowing it to add entire new wings to existing Hospitals, adding new technologies to Emergency Room facilities, or it could be used to purchase more Ambulances and train more Paramedics. A minor corporate tax change could free-up billions of pounds in sponsorship funding for NHS facilities. Way back in the 1990’s, Ralph Klein, then-Premier of the Canadian province of Alberta, decided to allow private (for profit) MRI clinics. Due to long wait times to get an Alberta government MRI scan in Alberta it was thought that private companies might take the risk, invest in the expensive and relatively new technology, and open MRI clinics for walk-in clients. It was expected that Alberta doctors would discuss with their patients the expected wait time for a government provided MRI (long wait, but no cost to the patient) vs. a private MRI clinic (an $800. fee, and typically a 1 hour wait) and it was the patient’s choice where they would get their scan. The liberal media went into a frenzy. Asking people to PAY for an MRI? Outrageous! And, anyhow, no one in their right mind would pay for an MRI, when the government-funded MRI’s were available at no cost to the patient! It was such a bad idea that it’s now the de facto state of affairs in Canada. In the final analysis, what the private MRI clinics did more than anything was to dramatically reduce the wait times at government MRI locations. Thousands of relatively wealthy citizens decided to pay out-of-pocket to access the results of their MRI scan more quickly. Which, until you’ve actually had cancer or some other serious ailment or injury, seems quite illogical. But waiting months to find out ‘how bad it really is’ just isn’t what patients prefer. Imagine that! Not only did private MRI clinics lower wait times for relatively wealthy Albertans, the clinics also lowered wait times for patients waiting in the government-funded MRI lineup — consequently, many seriously ill people were able to receive their treatment sooner and at much lower cost to the government healthcare system in the case of progressive diseases, due to sooner diagnostic access. The end of this story is that private MRI clinics saved Alberta Healthcare so much money, the Premier of Alberta later ordered that anyone who had paid for their own MRI at a private clinic, be partially reimbursed by Alberta Healthcare. Instead of an $800. bill for the patient, it became a $200. bill or even less, depending upon the exact MRI procedure. In Canada, it’s no longer MRI clinics only that function as private (for-profit) clinics. Many procedures or treatments can be arranged more quickly at the patient’s option, at a private medical facility. Not only that, but this additional premium (‘additional’ for those that already pay NHS premiums) could be deducted via automatic payroll deductions, while some banks might offer mortgages with NHS premiums built right into the loan, as they sometimes do with life insurance. Assuming that 40 million UK residents earn over £25,000 annually, the total yearly revenue added to the NHS would be in the range of £9 billion annually! Which would cover the NHS’s £450 million annual shortfall nicely, wouldn’t it? Instead of ‘just getting by’ on the national healthcare front, Britain could build one new Hospital per year, fill them with even more of the world’s best medical professionals, and add free dental work up to £200 per year to the many benefits of Britain’s National Health Service. That’s what I call a sustainable NHS budget plan. But imagine if all of the above suggestions — #1 through #5 — were implemented throughout the UK. 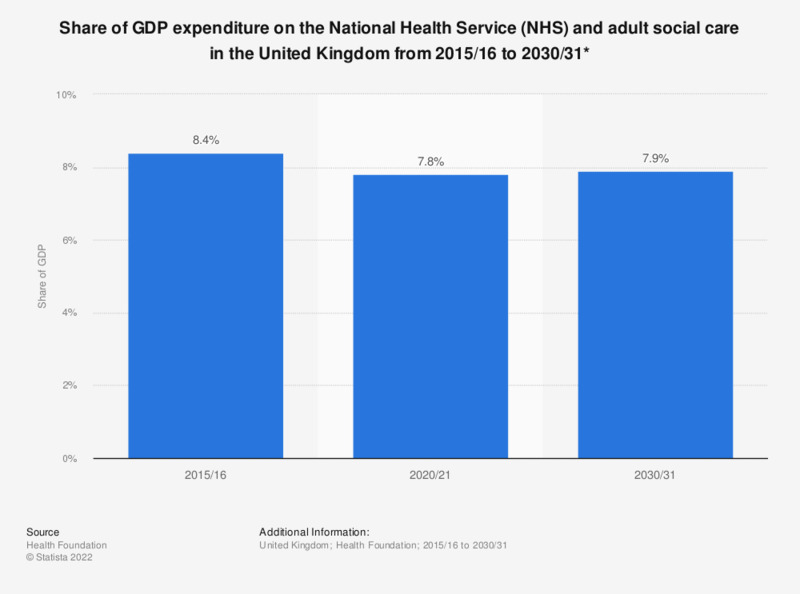 Not only would NHS budget deficits disappear, stable and long-term funding would become the norm, and the result would be better healthcare and shorter wait times for everyone. By Letter to Britain in British National Health Service, NHS (National Health Service), UK on January 12, 2017 . I think the NHS is amazing, nurses came in on their day off to check I was okay when I was being treated for Cancer. True about the ageing population – other factors are: 1. Technology is better so that those that may have died can be kept alive. 2. Drug barons shoot up the price of drugs that the country says we need – we have become like drug addicts.The number of people who do not pay in their National Health Insurance – (on average around £8,500 a year which is not cheap so if you pay you expect service) has increased many because there are more unemployed (that aren’t registered for employment) and there are open borders with the EU who have free care if they need it. The Government has also made serious cuts in health care and have tried to run it like a business rather than a service. People are currently dying on hospital trolleys in corridors waiting to be seen. I’m very pleased to hear about your experiences with the NHS, SOL. You know you have a good service when the employees ‘buy-in’ so deeply to their career that they stop by on their Days Off, to check in on their patients. Very impressive! A few decades back, I too was an NHS patient, and I received world-class care. I agree with you about having sufficient technology to keep people alive who would otherwise have passed away, and about the drug barons who charge outrageous amounts for their medicines. Both types of cost add up to an obscene amounts of money. India will help to solve that problem with a huge generic pharmaceutical industry that is now taking shape. In my post I referred to charging an NHS premium of £20 per month, for every resident (not only citizens, but any resident of the UK including EU citizens working in the UK, retired in the UK, or attending university in the UK) in the interests of accumulating more revenue for the NHS. All of NHS’ problems can be solved with the application of more revenue, although there is certainly the opportunity to save money by improving air quality and by hitting up major corporations for sponsorship revenue. It’s good to cut waste in any organization, but in the medical field, it must never compromise patient health or patient outcomes. Great post. When I lived in Spain everyone paid a little bit for the medical care – if you are a tax payer you pay anything from 10% to full price depending on your income. This way medical care was not abused. I think NHS should be basic but for some things which are borderline vanity I think we should pay extra. And you make a good point, some surgeries such as cosmetic enhancements, etc. should be treated differently. Perhaps NHS would help such patients to arrange financing for their botox injections, pouty lips, breast implants, or for their muscle implants (serious bodybuilders) and other optional surgery. Appreciate you sharing your experiences with Letter to Britain.